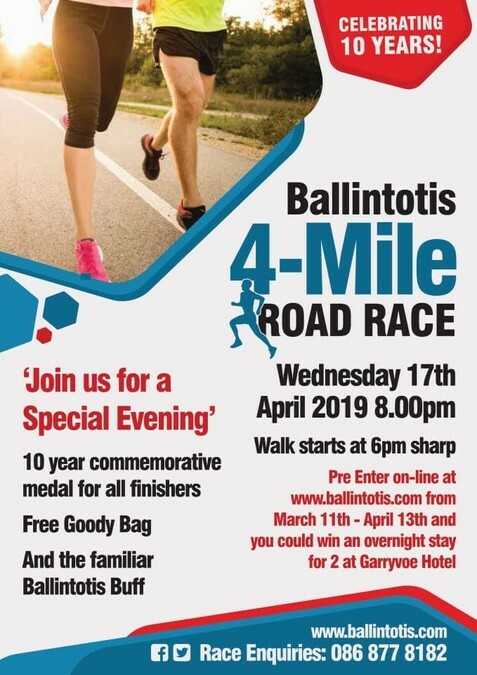 The 10th Annual Ballintotis Road Race takes place on this coming Wednesday evening, April 17th, commencing at 8pm. Entry desks will be open from 5pm to 7pm on Tuesday evening and from 1pm onwards on Wednesday at Ballintotis Community Centre. The Walk begins this year at the earlier time of 6pm – please enter from 5pm at the Community Centre. All proceeds from both events go to the upkeep and continued development of Ballintotis Community Centre.